The restaurant where we intended to meet in Queens was closed. We were led next door to a small Cuban place. I was already sitting down next to Stephano when I received his email that “We are having dinner at Rincon Criollo which is right next door to Mama Leti’s.” I sensed his enthusiasm for meeting the artists he had called together and that he was equally unknowing of how the dinner would play out. Before recalling that it was Dinner Without an Agenda I nearly asked if there would be any sort of introduction. I had only considered the benefit of being without an agenda and how it would be a means of liberating the discussion. In actuality it was unusual to be part of a social gathering where there was no authority or plan. It took some getting used to. Expecting to see a group of emerging artists like myself, I was pleasantly surprised to find myself in the company of a diverse group of artists of many ages, ethnicities and backgrounds. My answer to the question posed by Hallie Ringle of The Studio Museum of Harlem was being enacted. How do you see the relationship between artists and museums evolving? “I see museums being inclusive of a more diverse body of individuals in regards to age, race, gender, education and practice.” As Hallie sat across from me in the middle of the table, beckoning us to recall our own personal experiences of being in museums, I entertained the idea that the evolution I imagined might already be taking place. The conversation began around art residencies. Posing questions to the art world at-large the artists began to ask “What can art residencies do for us? Why aren’t there more of them?” Before verbally listing residencies we were all familiar with we considered the possibility of what types of practices should be housed within a museum. “Is it okay for a technology-based residency to house a start-up company that pays rent like a corporation?” And If that’s already happening, “will artists with non-monetizable practices be expected to perform like start-up companies?” Another concern was that art residencies are only inclusive of artists. “What about an architect? What about a technological designer?” Bearing the unlikelihood of resolving the art residency as a model on an empty stomach, we commenced to indulge in plantain chips, croquettes and wine. The subject of architecture returned as a point of reference to consider how the space of a museum could be a maker of intimacy and also exclusion. “The Studio Museum is designed to be accessible from the street, the glass facade is meant to be inviting,” Hallie described the Studio Museum with endearment and was determined to resolve how museums could serve artists and audiences alike, and what methods could function to bring viewers into the often exclusionary world of contemporary art. 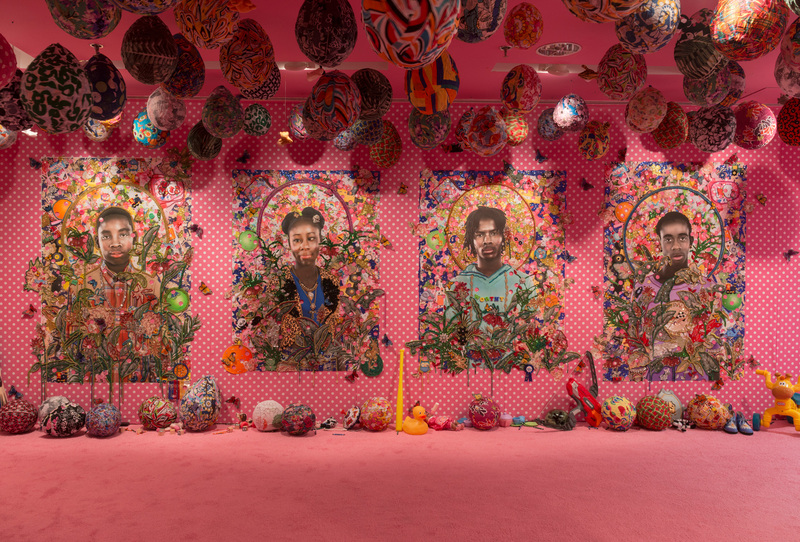 One of the guests mentioned Ebony G. Patterson’s exhibition at The Studio Museum as an example of how intimacy could be manifest in the white cube. We cited barriers such as high admission fees for preventing low-income individuals from ever becoming museum-goers. As one guest put it, without being forced to visit museums as a child there would never be a way to develop the familiarity necessary to ever feel comfortable in a museum. To be an artist means always considering how your work will be seen. My status and education as an artist allowed me to voice concerns that I knew people who are not artists face in a museum. As an apparatus that determines historical paradigms, serves as the public staging of art practice, and regulates the public threshold of art understanding, the museum must be multivalent. As Hallie invited and heeded our answers I sensed that it was vital for her to know “what is your experience like when you visit a museum?” As artists our dinner formed its own agenda to consider what that experience can ultimately be.